We already had our knee jerk reaction to the announcement, now comes the real deal: The Powetcast reacts to the new 52. The roundtable includes Zac Shipley, Captain Genius, Sean Orange, with special guest William West. 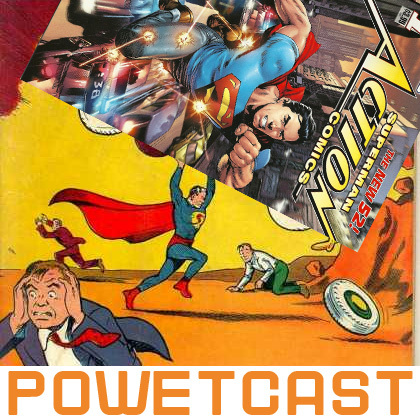 We’ll discuss our thoughts on the revamped DC Universe, theorize why some characters start from scratch and others don’t, and begrudgingly admit we all kinda like Rob Liefeld. We’ll also talk about the books that were worth reading and the ones we’re not going to continue on with #2. Batgirl has been a staple of the Batman mythos for decades, much like Much like Robin, the boy/girl wonder — though for not quite as long. The one near-constant of this title is that the girl in question usually ends up as the current Robin’s girlfriend. That might not be so bad, except the role sentences the unsuspecting Batgirl a slew of terrible fates (in no particular order): being shot, paralyzed, raped, tortured to (apparent) death, and even wiped out of existence. Mostly. Regardless, I’m sure fans everywhere remember when the very first Bat-Girl, Betty Kane, burst onto the scene with her red, green, and gold outfit. Read on to see more about Batwoman’s sidekick, and her not-quite-as-long-as-Robin line of unhyphenated successors.